ATTENTION! I am currently taking a break from custom portraits to pursue a long time dream of attending graduate school for art conservation. I currently have a wait list, and I will be contacting people from that list once I have more time to start painting again. If you are interested in joining the waitlist, please click the link at the bottom of this page that says, "Order Form," and fill out the form! I will not be taking any deposits at this time. There is a special place in our hearts for animals. We can't help but fall in love with their adoring eyes and silly personalities. You can buy a portrait of an animal that looks similar to yours, but how cool would it be to have a piece of art made to capture that unique expression and personality that you love so much? Pet portraits make wonderful gifts, and I guarantee the recipient will be ecstatic. 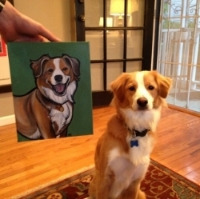 How could you not LOVE a portrait of your pet? Many of my customers have found the portraits to be quite healing while dealing with the sadness of losing a beloved pet. If you don't want to get someone a set of plates from their wedding registry, how about a Pawblo Picasso painting of their furry child to hang in their home instead? If your gift is time sensitive, order as early as possible as I can get pretty booked up (especially around the holidays). Once the portrait is made I can have a number of items printed with its image, including: smart phone cases, tote bags, wall clocks, mugs, area rugs, shower curtains, and more! For examples, check out my online store at Society6. Dolce and her Society6 throw pillow. I ship worldwide and all that is needed is at least one good photograph (digital preferable) that clearly shows the details. You can find more info on what type of photos I am looking for in the link below on "photographs." • You submit your order through my form below, "order." Submit your photo(s) through email or snail mail. • A 50% deposit (non-refundable) is required via Square or check to reserve your spot in my queue. I will contact you via email after you submit your order form. • I send you a scaled (to the painting) cropped version of the photo we decide on for approval, and then get started painting! • Once you are 100% happy with the finished painting and the balance is paid in full, the painting can be picked up or shipped to you! • To see a more detailed version of my process, please click the "Process" button below!